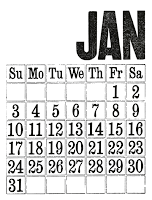 A Matter of Memories: :LINKS: Calendars, calendars and more calendars!! :LINKS: Calendars, calendars and more calendars!! Still need a calendar for 2010? Look no further...here are some great ideas and printables for making your very own customized calendar to enjoy all year long! **This 2010 calendar from Poppytalk is just so simple, yet stunning. I love the big numbers and the distressed font and it could be customized in so many ways. 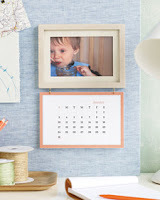 How about adding to little picture or other embellishment to the upper left corner to coordinate with each month? **I have two great calendars to share from the very talented Celeste Smith. The CD 2010 Calendar you see here on the right was created for the KI Memories blog. What a simple project for yourself or to give as a gift. 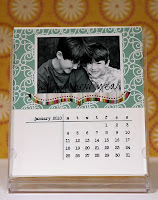 Then, there is this perpetual calendar that she created for the Pebbles Inc. blog. Another cute and easy project. **Now, this next link is just amazing!! It comes from Brenda Arnall and it's a calendar...and so much more! It's a calendar, a page planner, a shopping list and more! Every scrapper should have a book like this to start their creative year off right! 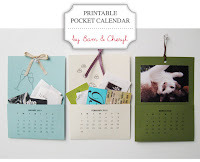 **Here's a great pocket calendar that I found recently on the Creature Comforts blog! The pockets are perfect for receipts, tickets and other little notes or momentos from the month. 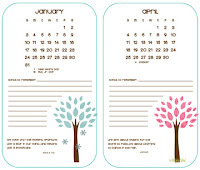 You can print and use the calendar pages as is or you can customize it with your own photos! **Finally, there was a very cool 2010 calendar project featured in the January issue of Martha Stewart Living. You can download the calendar pages here and use them as instructed or find another creative way to work them into your crafting!